SkyRama is a free to player MMO that sees players take control of their own airport and have to develop it until it becomes as big and bustling as possible. There is not much fun to have in small airport so building it up as quickly as possible will be the aim for all players. The problem here is that growing your airport is going to take you a very long time. Unfortunately, the game is very slow, so you will have to make do with the small airport for some time. However, you will eventually manage to expand it to have more than one runway and hangar. The problem with this is that it can be a very boring game at the start which may prove to be a turn off for many potential players. When you start, you literally have nothing more than a landing strip and an airplane. You need to use the plane to travel to different destinations, which of course you will earn money for. You will need to keep a firm eye on fuel on the condition of your plane. 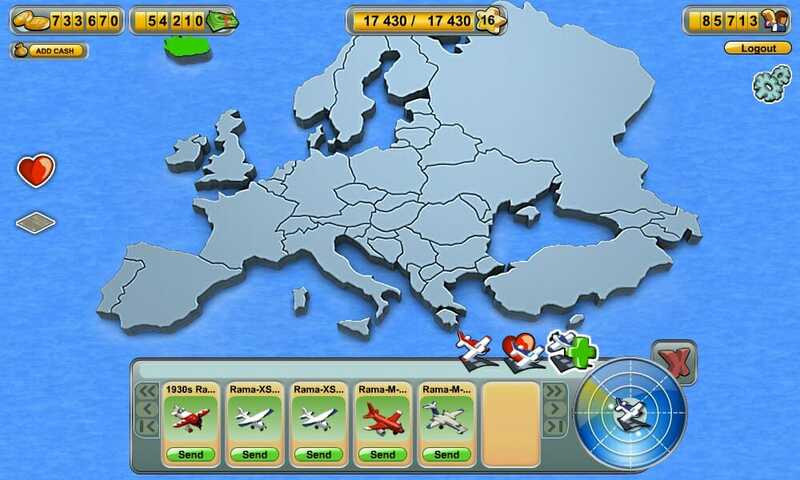 Other than that there is not much to do in the beginning other than send your planes to your friends airports and vice versa. There is no real competition, you cannot do anything to slow down other players and you cannot even trade with them. Once you do finally start to expand though, it does get a bit more interesting. As you get more runways and planes it starts to become a challenge as you try and manage everything. 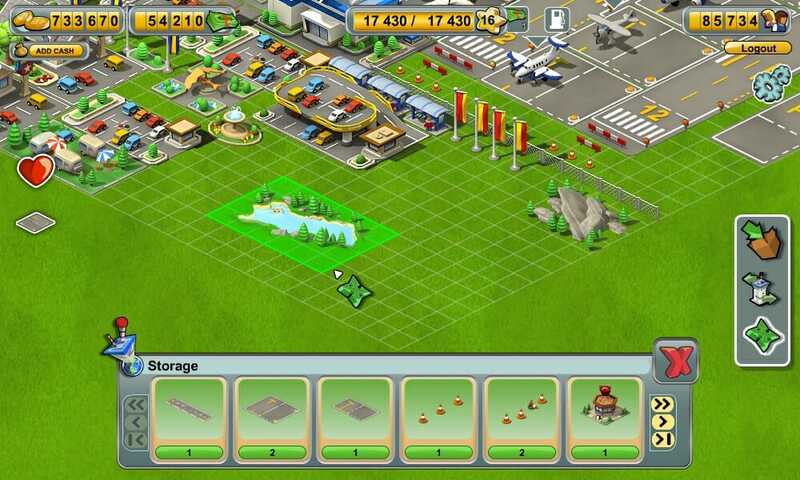 You will then also be able to start building other types of buildings for your airport and surrounding area. You will need hotels, parking lots, cafes and places of entertainment. Whilst the game play is a little boring, it does offer some pretty good social features. It is easy to make friends and chat and you can interact with them by visiting their airports. For a little bit of fun you can even have banners attached to the rear of your plane as you fly past your friends airports, saying whatever you want them to. The graphics are rather simple but it is the game play that is supposed to be the main point. 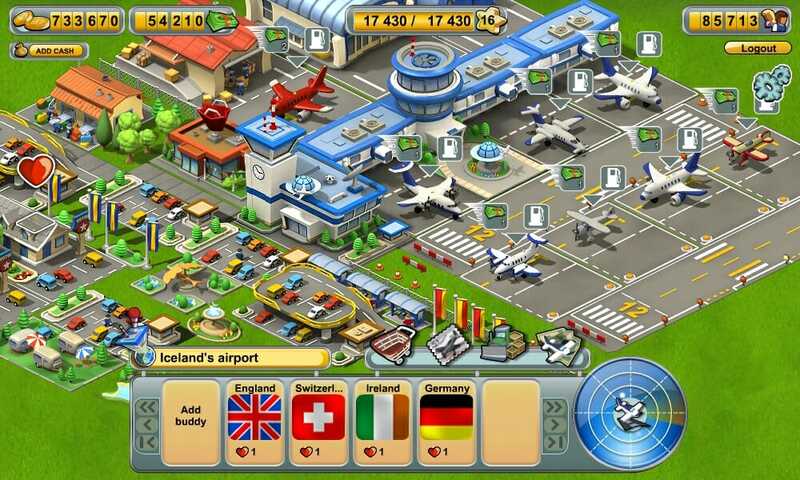 Unfortunately, that game play is a rather big letdown as there are better airport browser games out there. There is nothing that sets this game apart from the others, so it makes you wonder how they are going to attract players that are used to this niche. It is boring at the start, gets a little bit more challenging and fun and then goes back to being boring again. Nevertheless, there will be some that love this type of game and they may be able to get something out of it. For the rest of us, there are only so many times that we can construct buildings, collect money and resources and complete quests before it all starts to get a little on the tedious side. If you want a game to give you something to over a long period of time then you may be attracted to Skyrama, though if you want something that provides more action and is far more thrilling, you probably should stay away from this one. All you can do is try it out and see which category you fit into.